What Causes Shaking During Withdrawal? Experiencing body tremors is one of the major symptoms of withdrawal that may arise when you stop drinking after a long period of heavy or frequent alcohol use.1 In some cases, the trembling is so light that only the person who is suffering from it notices it; in other cases, the shaking is obvious to others. The involuntary shaking associated with alcohol withdrawal will typically be seen in those who have a long history of alcohol abuse or chronic struggles with alcohol addiction. The shaking due to alcohol withdrawal can occur in any body part, but most often occurs in the hands. Someone can develop alcoholic shakes as soon as 8 hours after the last drink. The likelihood and severity of alcoholic tremors are increased in people who drink more frequently and in higher amounts. Alcohol withdrawal symptoms, including shaking, are typically strongest 24 to 72 hours after the person had their last drink, but can continue for weeks. Deep sleep that lasts a day or more. Sensitivity to light, touch, and sound. Because delirium tremens can be so dangerous, people who develop signs of this severe withdrawal reaction should be placed under immediate medical care. During treatment for delirium tremens, the patient may need to be placed under sedation and have their breathing, heart rate, and blood pressure monitored throughout the entire withdrawal process. In some instances, those who suffer from the disorder require emergency life support. Treating alcoholic shaking is part of the process of treating alcohol withdrawal. When someone enters treatment for alcoholism or alcohol abuse, detoxification is the first stage of the treatment program. The detox period is when withdrawal symptoms will develop since the body is suddenly and completely deprived of alcohol. Many who go through acute alcohol withdrawal are at risk for dangerous, if not deadly health effects, including seizures—having round-the-clock medical supervision during this time will be an important part of the treatment protocol. After the initial withdrawal symptoms have subsided, you will also need to enter into a long-term treatment program that can help you learn to stay clean and sober for life. Inpatient programs offer a recovering drinker an entirely sober environment to give them focused time on recovery. Outpatient programs are another option that allows you to continue living at home, though some people find temptations to use more difficult to resist when living at home during treatment. These programs may be more suited to those with stable home environments, as well as those with supportive family and friends and other support networks. 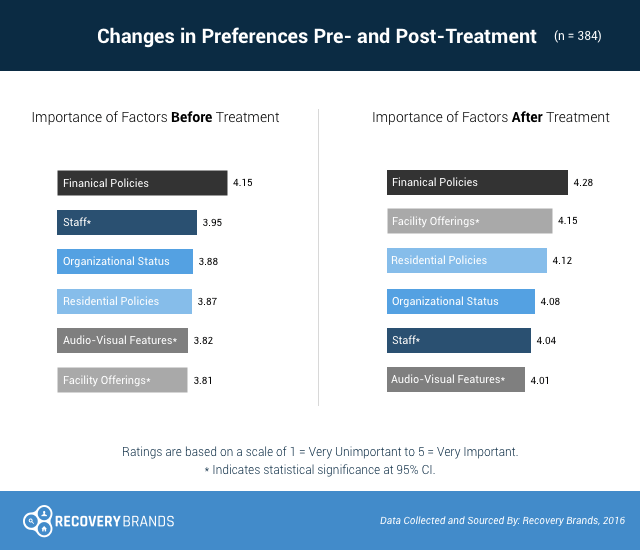 Data were collected in 2016 by Recovery Brands asking patients leaving an addiction recovery center what facility features they saw as high-priority aspects to look at when deciding on treatment. The most important priority was the center’s financial options, such as financial support, insurance accepted, and payment options. They also prioritized the facility’s offerings (quality of housing, recreational activities, quality of food) significantly more after completing treatment. As you enter treatment, you may want to look at a center’s payment policies as well as its offerings to help you make your final program decision. Ongoing care following the completion of formal treatment is another very important aspect of recovery. Aftercare in the form of continued counseling can help people stay focused on sobriety and continue to practice relapse prevention skills. Free self-help programs like Alcoholics Anonymous and SMART can also provide support and connection for recovering drinkers. Milanov, I., Toteva, S. & Georgiev, D. (1996). Alcohol withdrawal tremor. Electromyography and Clinical Neurophysiology, 36(1). 15-20. Trevisan, L. A., Boutros, N., Petrakis, I. L. & Krystal, J. H. (1998). Complications of alcohol withdrawal: pathophysiological insights. Alcohol Health and Research World, 22(1). 61-66. U.S. National Library of Medicine. (2010). Acute Alcohol Withdrawal. Alcohol Use Disorders: Diagnosis and Clinical Management of Alcohol-Related Physical Complications. NICE Clinical Guidelines, 100. U.S. National Library of Medicine. (2015). Delirium tremens.